J Transl Genet Genom 2018;2:8.10.20517/jtgg.2018.06© The Author(s) 2018. Department of Neonatal Medicine, Xin-Hua Hospital Affiliated with Shanghai Jiao Tong University School of Medicine, Shanghai 200092, China. Leukocyte adhesion deficiency type 1 (LAD-I) (MIM 600065) with an occurrence of 1 in every 100,000 live births is an autosomal recessive leukocyte recruitment deficiency. It is characterized by recurrent bacterial infections, poor wound healing, and delayed umbilical cord separation. Mutations have been found in integrin subunit beta 2 (ITGB2) gene that is located at 21q22.3 (NM_000211), which leads to the associated heterogeneous clinical spectrum of this disorder. Since some patients with severe forms die of overwhelming infection at a young age, proper, timely diagnoses become very critical. Although the diagnosis of LAD-I is based on typical clinical presentation, combined with laboratory demonstration of leukocytosis and reduction of CD18 expression, the precise molecular characterization is required for diagnosis confirmation. Recently the use of high-throughput targeted exome sequencing (TES) has resulted in faster sample turnaround time and more cost-effective analysis of the causative mutations. In this paper, we reported a rare case of a 43-day-old boy referred to our facility for severe leukocytosis, who responded poorly to antibiotic therapy, to highlight the importance of molecular testing to definitively establish the diagnosis when LAD-I is suspected. Moreover, the early diagnosis of immunodeficiency is essential for optimal management such as hematopoietic stem cell transplantation (HSCT) and rehabilitation outcomes. The young patient’s family is of Chinese Han ethnicity; a male baby, the second neonate of unrelated parents delivered via cesarean section after an uneventful full-term pregnancy. The proband’s birth weight was 3000 g. A review of the family history revealed that his older sister had passed away at the age of 3 months of sepsis with no response to various second-line and third-line antimicrobials. The patient’s condition was initially observed when he suffered a fever at the age of 25 days after birth; diagnosed then by his neonatologist as systemic inflammatory response syndrome (SIRS) in a local hospital. Laboratory tests revealed leukocytosis with neutrophil predominance [83,550 (109/L), 70.7%] and high C reactive protein (CRP) (69 mg/L). Intravenous (IV) antibiotics therapy (vancomycin combined with meropenem) was started and maintained for 18 days, with a good clinical response. Five days later, he was referred to our neonatal department because of hyperthermia and marked neutrophilia. Physical examination upon admission reported a well-developed infant, with head circumference of 34 cm and weighing 4140 g. Hepatosplenomegaly was noted, with liver span of 5 cm and spleen 3 cm below costal margin. The levels of serum inflammatory markers [Table 1] were abnormal, but cultures for bacteria and fungi were negative. Further laboratory investigations showed elevated aminotransferase and high cytomegalovirus (CMV) PCR titers in his urine (positive) and plasma (3.9 × 104 copies/mL) samples. After receiving the treatment of intravenous immunoglobulin (IVIG), second-line and third-line antimicrobials in the form of cefepime, teicoplanin teiculine and cephalosporins and IV ganciclovir (10 mg/kg/d for 14 days and 5 mg/kg/d for 7 days), he was discharged after three weeks with no fever, declined white cell count and CMV titers and normal liver function. He continued to receive oral ganciclovir (5 mg/kg/d) treatment after discharge. From then on the patient experienced recurrent upper respiratory tract infections and was admitted to our hospital with two episodes of deep infections coupled with hyperthermia and marked neutrophilia [Table 1]. At 2 months of age, a 2.5 cm × 3 cm erythematous skin area surrounding the umbilicus without pus or foul odors and tenderness to palpation around the umbilicus was noted. The ultrasound of the umbilical cord showed an infected urachus. The patient was treated with surgery debridement and resection of his urachus. At the same time, he received IV cefatriaxone, teicoplanin and ganciclovir (5 mg/kg/d). Five days later, his umbilicus had nearly returned to normal. He completed 20 days of antibiotic therapy before and after his surgery. At 4 months of age, he developed bronchopneumonia and showed neutrophilia with elevated CRP [Table 1]. Empiric antibiotic therapy was started after his admission and adjusted in form of cefmetazole, cefepime, tienam, meropenem, linezolid, fluconazole and teicoplanin based on those infection indexes. He was treated with IVIG again and IV ganciclovir (5 mg/kg/d) for 2 weeks. He recovered from his cough soon after; his body temperature fluctuated from 37.5 to 38.5 °C and it returned to normal after 3 weeks, then the patient was discharged with liver span of 3 cm, spleen palpable 2 cm below the left costal margin. Since a thorough history, physical examination, and laboratory workup failed to identify a clear etiology of this extremely abnormal case of leukocytosis, genetic analysis was initiated to find the cause. We performed TES of the immune disease panel (designed by MyGenostics, Beijing, China) on the pedigree. A total of 232 genes associated with defects in neutrophil chemotaxis and phagocytosis were selected using a gene capture strategy with a GenCap custom exome enrichment kit (MyGenostics, Beijing, China). In ITGB2 gene, a previously described mutation c.817G>A (p.G273R) was found in a homozygous state [Figure 1A]. This mutation co-segregated with the phenotype in the family. And a pedigree study showed that his father was a carrier of c.817G>A (p.G273R) mutation [Figure 1B], while his mother showed no variant [Figure 1C]. Furthermore the same allele was configured by qPCR to eliminate the possibility that his mother had a large fragment deletion involving this position [Figure 1D]. LAD-I is a rare immunodeficiency. HSCT remains the only curative option for these children in that conventional therapy with antibiotics and immunoglobulin transfusions only improving the symptoms, but not correcting the disease. The possibility of LAD-I should be raised with the existence of some typical clinical presentations, including delayed cord separation, recurrent severe infections from birth onward, e.g., repeated soft tissue infections, chronic ulcers of the skin and mucous membranes and strong leukocytosis, especially neutrophilia, during periods of infection. Even though flow cytometer (FCM) provides a tool for its diagnosis, it is not available in many hospitals. Genetic analysis is an effective alternative for diagnosis confirmation in patients with LAD-I and also during prenatal diagnosis. The emergence of next generation sequencing technologies constituted a turning point for the advancement of our understanding of rare diseases including various primary immune-deficiencies which require a broad search for causal variants across their genetically heterogeneous spectrum. And the high throughput TES for specific (known) disease-causing genes has been applied to assist with molecular diagnosis of well-defined disorders caused by a group of genes. Our patient is characterized by a leukocytosis with neutrophil predominance that never reached normal level after antibiotic treatment [Table 1]. We confirmed the diagnosis by genetic testing. c.817G>A in a homozygous form was identified, which resulted in the amino acid substitution Gly273Arg residing in exon 8. This mutation shows nearly no CD18 expression on the leukocyte surface. If it is, 1% of the CD18 expression in normal subjects can be defined as severely deficient patients. The condition is severe and often results in repeated infections in infants and young children, which is consistent with the clinical manifestation of this proband. His father carries heterozygotes for this mutation and his mother is normal of this allele; both parents did not give a history of consanguinity. The lack of consanguinity, as is the characteristic of LAD-I patients, indicated that autosomal recessive inheritance is less likely for this patient, although not excluded. Furthermore, the sole presence of the identified variant in his father revealed that the mutation on the other allele might emerge de novo, although this kind of probability is very low. Based on our pedigree analysis results, loss of heterozygosis might be the most relevant possibility, that the embryo of the proband has undergone a change before its development, leading to two copies of its ITGB2 gene being paternal mutations. Another remarkable finding was the association with hepatomegaly, splenomegaly and elevated aminotransferase detected during his hospitalization. These were typical manifestations of acquired CMV infection. Though treated with ganciclovir, his CMV IgM and PCR titers never reached normal. We considered that it might be due to his impaired immunological function since CMV is an important opportunistic pathogen in immunocompromised patients. Finally, a review of the literature concerning LAD-I was done by a search of Chinese Biological Medicine Database and PubMed. The first LAD-I was described in 1984 with more than 300 cases and 96 pathogenic mutations [Table 2][11-44] reported, including 22 different kinds of deletion mutations, 3 insertion, 5 deletion/insertion, 11 nonsense, 12 splice and 43 missense. Mutations either lead to absent protein or expression of a truncated form of the protein usually resulting in low or no expression. Three clinical phenotypes of LAD I appear to be directly related to the level of CD18 expression on patients’ leucocytes. Patients with severe phenotype have < 2% of CD18 expression (LAD-I0) whereas 2%-20% (LAD-I−) expression have moderate phenotype. Rarely patients may have > 20% or near normal expression of CD18 (LAD-I+). In conclusion, we presented a case of LAD-I associated with acquired CMV infection, an important opportunistic pathogen in patients who are immunocompromised. The genetic investigation helped us to identify the etiology of severe leukocytosis of the patient during his infancy. Following his discharge, further clinical course was marked by successive and progressive infections. The patient was then recommended to another hospital where HSCT is available for immunodeficiency. He was reported to be improving and thriving until now. This study is approved by the institutional review board of Ethics Committee of Xinhua Hospital Affiliated to Shanghai Jiaotong University School of Medicine. Written consent form was obtained from the patient. 1. Hanna S, Etzioni A. Leukocyte adhesion deficiencies. Ann N Y Acad Sci 2012;1250:50-5. 2. Schmidt S, Moser M, Sperandio M. The molecular basis of leukocyte recruitment and its deficiencies. Mol Immunol 2013;55:49-58. 3. Lim EC, Brett M, Lai AH, Lee SP, Tan ES, Jamuar SS, Ng IS, Tan EC. 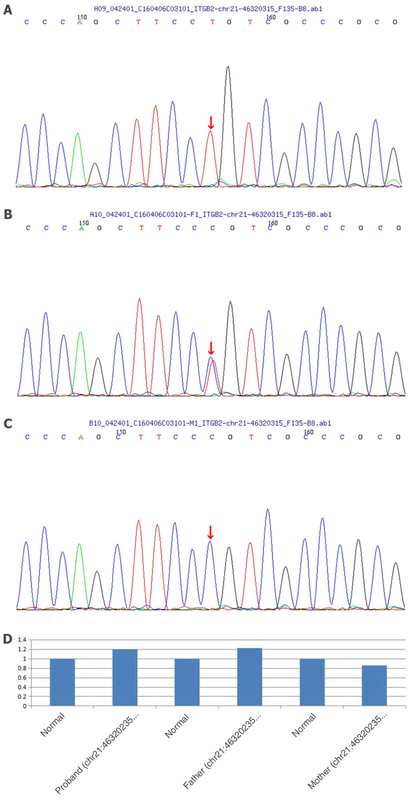 Next-generation sequencing using a pre-designed gene panel for the molecular diagnosis of congenital disorders in pediatric patients. Hum Genomics 2015;9:33-43. 4. Boqh LD, Duling TA. Flow cytometry instrumentation in research and clinical laboratories. Clin Lab Sci 1993;6:167-73. 5. Fernandez MA, Gouveia S, Couce ML. NGS technologies as a turning point in rare disease research, diagnosis and treatment. Curr Med Chem 2018;25:404-32. 6. Nijman IJ, van Montfrans JM, Hoogstraat M, Boes ML, van de Corput L, Renner ED, van Zon P, van Lieshout S, Elferink MG, van der Burg M, Vermont CL, van der Zwaag B, Janson E, Cuppen E, Ploos van Amstel JK, van Gijn ME. Targeted next-generation sequencing: a novel diagnostic tool for primary immunodeficiencies. J Allergy Clin Immunol 2014;133:529-34. 7. Kuijpers TW, Van Lier RA, Hamann D, de Boer M, Thung LY, Weening RS, Verhoeven AJ, Roos D. Leukocyte adhesion deficiency type 1 (LAD-I)/variant. A novel immunodeficiency syndrome characterized by dysfunctional beta2 integrins. J Clin Invest 1997;100:1725-33. 8. Hodges KB, Vnencak-Jones CL, Larson RS, Kinney MC. Rarity of genomic instability in pathogenesis of systemic anaplastic large cell lymphoma (ALCL) in immunocompetent patients. Hum Pathol 1999;30:173-7. 9. Jackson SE, Redeker A, Arens R, van Baarle D, van den Berg SPH, Benedict CA, Čičin-Šain L, Hill AB, Wills MR. CMV immune evasion and manipulation of the immune system with aging. Geroscience 2017;39:273-91. 10. Dana N, Todd RF 3rd, Pitt J, Springer TA, Arnaout MA. Deficiency of a surface membrane glycoprotein (Mo1) in man. J Clin Invest 1984;73:153-9. 11. Roos D, Meischl C, de Boer M, Simsek S, Weening RS, Sanal O, Tezcan I, Güngör T, Law SK. Genetic analysis of patients with leukocyte adhesion deficiency: genomic sequencing reveals otherwise undetectable mutations. Exp Hematol 2002;30:252-61. 12. Sligh JE Jr, Hurwitz MY, Zhu CM, Anderson DC, Beaudet AL. An initiation codon mutation in CD18 in association with the moderate phenotype of leukocyte adhesion deficiency. J Biol Chem 1992;267:714-8. 13. van de Vijver E, Maddalena A, Sanal Ö, Holland SM, Uzel G, Madkaikar M, de Boer M, van Leeuwen K, Köker MY, Parvaneh N, Fischer A, Law SK, Klein N, Tezcan FI, Unal E, Patiroglu T, Belohradsky BH, Schwartz K, Somech R, Kuijpers TW, Roos D. Hematologically important mutations: leukocyte adhesion deficiency (first update). Blood Cells Mol Dis 2012;48:53-61. 14. Bernard Cher TH, Chan HS, Klein GF, Jabkowski J, Schadenböck-Kranzl G, Zach O, Roca X, Law SK. A novel 3’ splice-site mutation and a novel gross deletion in leukocyte adhesion deficiency (LAD)-1. Biochem Biophys Res Commun 2011;404:1099-104. 15. Roos D, Law SK. Hematologically important mutations: leukocyte adhesion deficiency. Blood Cells Mol Dis 2001;27:1000-4. 16. Fiorini M, Piovani G, Schumacher RF, Magri C, Bertini V, Mazzolari E, Notarangelo L, Notarangelo LD, Barlati S. ITGB2 mutation combined with deleted ring 21 chromosome in a child with leukocyte adhesion deficiency. J Allergy Clin Immunol 2009;124:1356-8. 17. López Rodríguez C, Nueda A, Grospierre B, Sánchez-Madrid F, Fischer A, Springer TA, Corbí AL. Characterization of two new CD18 alleles causing severe leukocyte adhesion deficiency. Eur J Immunol 1993;23:2792-8. 18. Moore SW, Sidler D, Zaahl MG. The ITGB2 immunomodulatory gene (CD18), enterocolitis, and Hirschsprung's disease. J Pediatr Surg 2008;43:1439-44. 19. Hinze CH, Lucky AW, Bove KE, Marsh RA, Bleesing JH, Passo MH. Leukocyte adhesion deficiency type 1 presenting with recurrent pyoderma gangrenosum and flaccid scarring. Pediatr Dermatol 2010;27:500-3. 20. Tone Y, Wada T, Shibata F, Toma T, Hashida Y, Kasahara Y, Koizumi S, Yachie A. Somatic revertant mosaicism in a patient with leukocyte adhesion deficiency type 1. Blood 2007;109:1182-4. 21. Allende LM, Hernández M, Corell A, García-Pérez MA, Varela P, Moreno A, Caragol I, García-Martín F, Guillén-Perales J, Olivé T, Espa-ol T, Arnaiz-Villena A. A novel CD18 genomic deletion in a patient with severe leucocyte adhesion deficiency: a possible CD2/lymphocyte function-associated antigen-1 functional association in humans. Immunology 2000;99:440-50. 22. Parvaneh N, Mamishi S, Rezaei A, Rezaei N, Tamizifar B, Parvaneh L, Sherkat R, Ghalehbaghi B, Kashef S, Chavoshzadeh Z, Isaeian A, Ashrafi F, Aghamohammadi A. Characterization of 11 new cases of leukocyte adhesion deficiency type 1 with seven novel mutations in the ITGB2 gene. J Clin Immunol 2010;30:756-60. 23. Matsuura S, Kishi F, Tsukahara M, Nunoi H, Matsuda I, Kobayashi K, Kajii T. Leukocyte adhesion deficiency: identification of novel mutations in two Japanese patients with a severe form. Biochem Biophys Res Commun 1992;184:1460-7. 24. Uzel G, Tng E, Rosenzweig SD, Hsu AP, Shaw JM, Horwitz ME, Linton GF, Anderson SM, Kirby MR, Oliveira JB, Brown MR, Fleisher TA, Law SK, Holland SM. Reversion mutations in patients with leukocyte adhesion deficiency type-1 (LAD-1). Blood 2008;111:209-18. 25. Lorusso F, Kong D, Jalil AK, Sylvestre C, Tan SL, Ao A. Preimplantation genetic diagnosis of leukocyte adhesion deficiency type I. Fertil Steril 2006;85:494.e15-8. 26. Hogg N, Stewart MP, Scarth SL, Newton R, Shaw JM, Law SK, Klein N. A novel leukocyte adhesion deficiency caused by expressed but nonfunctional beta2 integrins Mac-1 and LFA-1. J Clin Invest 1999;103:97-106. 27. Wardlaw AJ, Hibbs ML, Stacker SA, Springer TA. Distinct mutations in two patients with leukocyte adhesion deficiency and their functional correlates. J Exp Med 1990;172:335-45. 28. Back AL, Kwok WW, Hickstein DD. Identification of two molecular defects in a child with leukocyte adherence deficiency. J Biol Chem 1992;267:5482-7. 29. Yassaee VR, Hashemi-Gorji F, Boosaliki S, Parvaneh N. Mutation spectra of the ITGB2 gene in Iranian families with leukocyte adhesion deficiency type 1. Hum Immunol 2016;77:191-5. 30. Arnaout MA, Dana N, Gupta SK, Tenen DG, Fathallah DM. Point mutations impairing cell surface expression of the common beta subunit (CD18) in a patient with leukocyte adhesion molecule (Leu-CAM) deficiency. J Clin Invest 1990;85:977-81. 31. Tone Y, Wada T, Shibata F, Toma T, Hashida Y, Kasahara Y, Koizumi S, Yachie A. Somatic revertant mosaicism in a patient with leukocyte adhesion deficiency type 1. Blood 2007;109:1182-4. 32. Ohashi Y, Yambe T, Tsuchiya S, Kikuchi H, Konno T. Familial genetic defect in a case of leukocyte adhesion deficiency. Hum Mutat 1993;2:458-67. 33. Cox DP, Weathers DR. Leukocyte adhesion deficiency type 1: an important consideration in the clinical differential diagnosis of prepubertal periodontitis. A case report and review of the literature. Oral Surg Oral Med Oral Pathol Oral Radiol Endod 2008;105:86-90. 34. Nelson C, Rabb H, Arnaout MA. Genetic cause of leukocyte adhesion molecule deficiency. Abnormal splicing and a missense mutation in a conserved region of CD18 impair cell surface expression of beta 2 integrins. J Biol Chem 1992;267:3351-7. 35. Shaw JM, Al-Shamkhani A, Boxer LA, Buckley CD, Dodds AW, Klein N, Nolan SM, Roberts I, Roos D, Scarth SL, Simmons DL, Tan SM, Law SK. Characterization of four CD18 mutants in leucocyte adhesion deficient (LAD) patients with differential capacities to support expression and function of the CD11/CD18 integrins LFA-1, Mac-1 and p150,95. Clin Exp Immunol 2001;126:311-8. 36. Back AL, Kerkering M, Baker D, Bauer TR, Embree LJ, Hickstein DD. A point mutation associated with leukocyte adhesion deficiency type 1 of moderate severity. Biochem Biophys Res Commun 1993;193:912-8. 37. Li L, Jin YY, Cao RM, Chen TX. A novel point mutation in CD18 causing leukocyte adhesion deficiency in a Chinese patient. Chin Med J (Engl) 2010;123:1278-82. 38. Bruno DL, Stark Z, Amor DJ, Burgess T, Butler K, Corrie S, Francis D, Ganesamoorthy D, Hills L, James PA, O'Rielly D, Oertel R, Savarirayan R, Prabhakara K, Salce N, Slater HR. Extending the scope of diagnostic chromosome analysis: detection of single gene defects using high-resolution SNP microarrays. Hum Mutat 2011;32:1500-6. 39. Kishimoto TK, O'Conner K, Springer TA. Leukocyte adhesion deficiency. Aberrant splicing of a conserved integrin sequence causes a moderate deficiency phenotype. J Biol Chem 1989;264:3588-95. 40. Wright AH, Douglass WA, Taylor GM, Lau YL, Higgins D, Davies KA, Law SK. Molecular characterization of leukocyte adhesion deficiency in six patients. Eur J Immunol 1995;25:717-22. 41. Fathallah DM, Jamal T, Barbouche MR, Bejaoui M, Hariz MB, Dellagi K. Two novel frame shift, recurrent and de novo mutations in the ITGB2 (CD18) gene causing leukocyte adhesion deficiency in a highly inbred North African population. J Biomed Biotechnol 2001;1:114-21. 42. Hixson P, Smith CW, Shurin SB, Tosi MF. Unique CD18 mutations involving a deletion in the extracellular stalk region and a major truncation of the cytoplasmic domain in a patient with leukocyte adhesion deficiency type 1. Blood 2004;103:1105-13. 43. Fiorini M, Vermi W, Facchetti F, Moratto D, Alessandri G, Notarangelo L, Caruso A, Grigolato P, Ugazio AG, Notarangelo LD, Badolato R. Defective migration of monocyte-derived dendritic cells in LAD-1 immunodeficiency. J Leukoc Biol 2002;72:650-6. 44. Roos D, Meischl C, de Boer M, Simsek S, Weening RS, Sanal O, Tezcan I, Güngör T, Law SK. Genetic analysis of patients with leukocyte adhesion deficiency: genomic sequencing reveals otherwise undetectable mutations. Exp Hematol 2002;30:252-61.